Tarun Vijay is the director of the Dr Syama Prasad Mookerjee Research Foundation. The only place on this planet that the Hindus can rightfully claim they belong to is Hindustan or India. And the only people on this earth who feel hesitant to speak for their dharma or the basic identity too are Hindus. In Indian politics, run and financed by the Hindu majority, taking up Hindu issues means an extra effort to stand and face the charges too acidic. It pays to be a non-Hindu in a Hindu majority Hindustan, frankly. Hence it's time when the followers of the legacy that began with Dr. Hedgewar founding the nationalist school of thought known as the RSS must assert and justify their birth, first in the form of Jana Sangh and later re-incarnated as the Bharatiya Janata Party. I was there when the first-ever convention of the newly-formed BJP took place in Mumbai, in 1980, christened as Samata Nagar. And the star attraction in that meeting was none else other than Mohammad Karim Chagla, the octogenarian scholar and statesman. The BJP could have adopted a pure saffron flag as its new motif, like the old Jana Sangh, but it chose the green and saffron. Jana Sangh too, in early fifties could have been a Hindu Sangh, but the stalwarts in those times chose a name that would represent all --any one who is an Indian, no matter what his faith is, without compromising on the basic characteristics of the nation i.e. Hindu. A nation is defined not by the forex reserves or the military prowess but by the contours of her civilisational traditions and the collective struggles and sufferings. We are, unquestioningly and unapologetically Hindu in our national colours as much as the USA is Latin Christian and the UK works for all communities still adhering as a state to the spiritual umbrella of the Church of England. An Obama taking oath of the presidential office on the Bible doesn't become a communally hateful ruler for the other faiths. So is with us. A Hindu-majority India remains the only guarantee of a pluralistic and democratic nation. The moment we accept the de-Hinduisation process of the nation as a sign of secularism and an acceptable factor in polity, we are not only doomed as an Indian nation but also invite Talibanisation of the society. Money, riches, industrialisation, military arrogance couldn't save the mighty Soviet empire. You need a little more to live as humans, which the Communists refused to accept. The IT power and the strength of brilliance coupled with loyalty to the adopted land (we do not bomb the land we adopt- a trait Hindus are known and respected for the world over) is making them use force to reckon with- as Thomas Freidman too discussed in his celebrated book The World is Flat. But that alone won't suffice to define the nation that has been known since millenniums world over as the land of the Hindus. It's the so-called secular flabbiness of the neo-rich and subjugated colonised English-speaking elite that has taken up the place left vacant by British sergeants and colonial masters. Hate Hindu- is their new professional slogan. Anything Hindu is despicable and arrogantly dismissible. Destroy Ram Sethu, arrest Kanchi Shankaracharya on Diwali night, ignore the brutal killing of an 80-year-old monk on Krishna Janmashtami night in Kandhamal, simply delete the memory of Godhra and never answer why 59 men, women and little kids were burnt to death in a steel compartment, on February 27 seven years ago, never ever mention the 290 Hindus murdered during what is known as Gujarat riots, never discuss the forced exodus of five lakh Kashmiri Hindus after their women were raped and children killed by 'brave' Nizam-e-Mustafa' Ghazis. That's the new order, which has to be exposed and dismantled if India has to survive. They insult and demand the abolition of a language without which their birth can't be celebrated, marriage can't be solemnised and even in death, the same language is used. That's Sanskrit. Like they can denounce their motherland's fragrance, they also humiliate the language of their birth and death. That's their morality and honesty. Last week Al-Jazeera, a channel more known for putting on air Osama and Al Jawahiri statements took my interview, 'to present the true colours of Indian culture' as its Canadian correspondent requested. When the show was aired, it showed Hindu right activists as simple monsters and barbarians and dishonestly juxtaposed their prejudices to 'justify' their pre-decided views. That's what this small minority of money wielding de-culturised slave class of the dollar world does anywhere it gets a little dominance -a Gulag at every desk. Against such elements of hate, the Saffron is fighting a democratic battle through a new generation of IT-savvy saffronite youths. In the blog world, Facebook, internet battles, the Saffron is reigning high and the way we get their responses from California to Bangalore and Kolkata to Chennai via Santa Fe, it's simply bewildering and a great morale booster. There are hundreds of them. Mostly post-graduates, engineers, MBAs, fresh IITians and doctors of philosophy, who have left the lure of the lucre and chose to work in the remote regions of the Andamans, Changlang, Diphu, Aizawl and the Nilgiri hills. From Wynad to Wakho and Leh to Lalganj, there is not a single block or tehsil or district where various workers and organisations inspired by the RSS are not active. For the first time in the history of this nation, a non-monastic order of the socially dedicated young men and women has taken roots which puts the nation before everything else, work like a sanyaasi without an ochre robe. They run village development projects, water harvesting and production of bio-foods and hospitals and schools and slum-area service projects. One such organisation, Vidya Bharati, has become the largest academic institution without government help having more than one lakh teachers and twenty-four lakh students in literally every nook and corner of the nation. B.M.S has claimed a membership of 84 lakhs, to be the biggest labour organisation of the land. Amongst students, teachers, politicians, religious clergy, doctors, and even visually-challenged people, RSS-inspired organizations are active and moving fast to get the top slot. There is hardly a stream in the national life which is not touched and influenced by the ideology espoused by this Saffron movement which began just a year before almost the year Communist movement took shape in India. Though the Communist movement remained confined to a few corners and split in more than 24 various splinter groups, Sangh-inspired organisations are setting the agenda in their respective fields and one of their Swayam Sewak unfurled the Tricolor at the Red Fort six times in continuation. Can any hateful, divisive organisation get this kind of response from the people year after year? How can ill-feelings towards another community inspire young professionals continuously for the last eight decades to devote their life and forget the attractions of a glamorous career just for the cause of rebuilding the nation? Can any other organisation, specially the secular and the Left variety, show its positive and harmonious contribution for the development of the society in comparison to the RSS work? Against all odds, to oppose political families turning India into their personal fiefdom, to stop India becoming a dharamshala for foreign infiltrators and putting an end to the endless pusillanimity against Jihadi terrorism, a party has to come to power that has the guts to call a spade a spade and strengthen the sinews to provide security and ensure prosperity. Enough is enough. 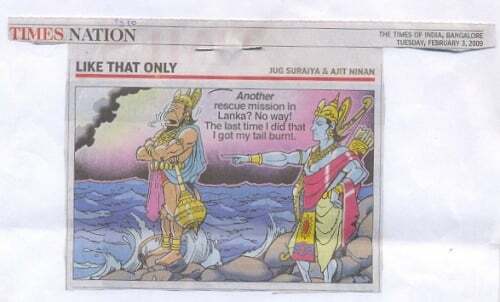 Karnataka: The Times of India in their Bangalore edition of 3rd February 09 denigrated Lord Sri Ram and Lord Hanuman in the form of Cartoon. The cartoon is printed on page no.10 of the said edition. When HJS came to know about this denigration, on that same day HJS wrote a protest letter to Times of India for asking an Unconditional apology for Hurting Hindus religious sentiments. 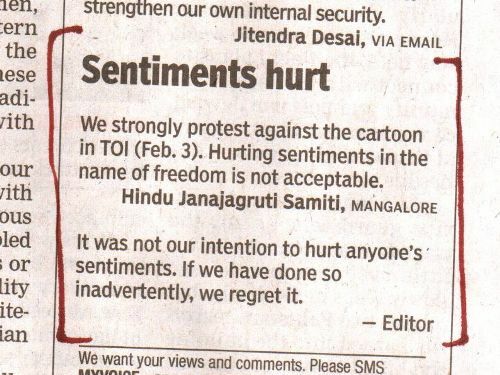 Until now HJS representative of Karnataka has not received any apology letter or phone call from TOI office. HJS is taking follow up of this issue. SILCHAR: Christian missionaries preach many things and quote the Bible in particular to say, “We do not hurt other denominations.” And behind the facade of this Biblical adherence lies the ugly face of their activities to take resort to illegal and fraud for conversion of the innocent and simple minded people by force, inducement and questionable means. It is now more than clear that it is these missionaries who create conflict and stoke the flame of religious bigotry and communal passion. Glaring example is Kandhamal.Laxamananda Saraswati was murdered because he had become a formidable force in the area against forced conversion of Hindus. His popularity and following in the area was rapidly increasing, scaring the Christian zealots. According to the complaints of Hindu Nagas, the Christian missionaries from Tamenlong in Manipur in collusion with their Barak Valley activists have been converting the Hindus of Ujan Tarapur through allurements and even by threats. Zeliangrong Haraku Association (ZHA), an organisation of Naga Tribes—Zeme, Rongmei and Liyangmei—has taken serious exception to the decision of the Myanmar Mission of the Council of Nagaland Baptist Churches (CNBC) to evangelise the Nagas. Gaifui Rongmei, Pinsingpoi Rongmei and Chinkudai Rongmei of Ujan Tarapur had complained earlier that “this proselytisation drive is not new.” Three missionaries have been frequenting their areas and forcing them to embrace Christianity. This process started in 1996 when copies of Bible were distributed among the 50 odd families of the village. Following year their visit was with questionnaires to all of them and particularly on the essence of the Bible and what they have learnt about Jesus Christ and Christianity. A teacher teaching Maths to five-year-old Arnav asked him, "If I give you one apple and one apple and one apple, how many apples will you have?" Within a few seconds Arnav replied confidently, "Four!" Arnav had seen the disappointment on his teacher's face. He calculated again on his fingers. But within him he was also searching for the answer that will make the teacher happy. His search for the answer was not for the correct one, but the one that will make his teacher happy. This time hesitatingly he replied, "Four…"
The disappointment stayed on the teacher's face. She remembered that Arnav liked strawberries. She thought maybe he doesn't like apples and that is making him loose focus. This time with an exaggerated excitement and twinkling in her eyes she asked, "If I give you one strawberry and one strawberry and one strawberry, then how many you will have?" The teacher now had a victorious smile. Her approach had succeeded. She wanted to congratulate herself. But one last thing remained. Once again she asked him, "Now if I give you one apple and one apple and one more apple how many will you have?" Promptly Arnav answered, "Four! The teacher was aghast. "How Arnav, how?" she demanded in a little stern and irritated voice. In a voice that was low and hesitating young Arnav replied, "Because I already have one apple in my bag." "When someone gives you an answer that is different from what you expect. Don't think they are wrong. There maybe an angle that you have not understood at all. You will have to listen and understand, but never listen with a predetermined notion. The greatest name man ever gave to God is Truth. Truth does not pay homage to any society, modern or ancient. Society has to pay homage to truth, or die. By truth we attain fruits of work. Through truth everything is attained. In truth everything is established. 18. Understand "Money Isn't Everything"
Ask nothing; want nothing in return. Give what you have to give; it will come back to you but multiplied a thousand fold but the attention must not be on that. Yet have the power to give: give, and there it ends. 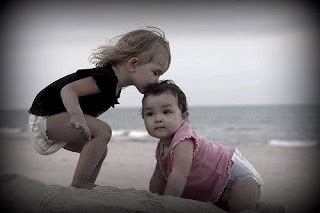 Learn that the whole of life is giving, that nature will force you to give. So give willingly. Sooner or later you will have to give up. You come into life to accumulate. With clenched hands you want to take. But nature puts a hand on your throat and makes your hands open. Whether you will it or not, you have to give. The moment you say, "I will not". the blow comes; you are hurt. None is there but will be compelled, in the long run, to give everything. And the more one struggles against this law, the more miserable one feels. It is because we dare not give, because we are not resigned enough to accede to this grand demand of nature, that we are miserable. The forest is gone, but we get heat in return. The sun is taking up water from the ocean, to return it in showers. You are a machine for taking and giving: you take, in order to give. Ask, therefore, nothing in return; but the more you give, the more will come to you. The quicker it will be filled up by the external air; and if you close all the doors and every aperture, that which is within will remain, but that which is outside will never come in, and that which is within will stagnate, degenerate, and become poisoned. Be as the river that is continually emptying itself into the ocean and is continually filling up again. Bar not the exit into the ocean. The moment you do that, death seizes you. Reproduce below an article by Pervez Hoodbhoy, a Pakistani academic, published in the Jan. 2009 edition of 'Newsline', a Pakistani news magazine. Please read the article and think what India will be fighting against in the years to come. The common belief in Pakistan is that Islamic radicalism is a problem only in FATA, and that madrassas are the only institutions serving as jihad factories. This is a serious misconception. Extremism is breeding at a ferocious rate in public and private schools within Pakistan's towns and cities. Left unchallenged, this education will produce a generation incapable of co-existing with anyone except strictly their own kind. The mindset it creates may eventually lead to Pakistan's demise as a nation state. A full-scale war is being fought in FATA, Swat and other "wild" areas of Pakistan, resulting in thousands of deaths. It is only a matter of time before this fighting shifts to Peshawar and Islamabad (which has already been a witness to the Lal Masjid episode) and engulfs Lahore and Karachi as well. The suicide bomber and the masked abductor have crippled Pakistan's urban life and shattered its national economy. What explains Pakistan's collective masochism? To understand this, one needs to study the drastic social and cultural transformations that have rendered this country so completely different from what it was in earlier times. In Pakistan's lower-middle and middle classes lurks a grim and humourless Saudi-inspired revivalist movement that frowns on any and every expression of joy and pleasure. Lacking any positive connection to culture and knowledge, it seeks to eliminate "corruption" by regulating cultural life and seizing control of the education system. "Classical music is on its last legs in Pakistan; the sarangi and vichitraveena are completely dead," laments Mohammad Shehzad, a music aficionado. Indeed, teaching music in public universities is violently opposed by students of the Islami Jamaat-e-Talaba at Punjab University. So the university has been forced to hold its music classes elsewhere. Religious fundamentalists consider music haram or un-Islamic. Kathak dancing, once popular with the Muslim elite of India, has few teachers left. Pakistan produces no feature films of any consequence. Nevertheless, the Pakistani elite, disconnected from the rest of the population, live their lives in comfort through their vicarious proximity to the West. Alcoholism is a chronic problem of the super rich of Lahore – a curious irony for this deeply religious country. Pakistan's self-inflicted suffering comes from an education system that, like Saudi Arabia's system, provides an ideological foundation for violence and future jihadists. It demands that Islam be understood as a complete code of life, and creates in the mind of a school-going child a sense of siege and embattlement by stressing that Islam is under threat everywhere. Alongside are scanned pictures from an illustrated primer for the Urdu alphabet. The masthead states that it has been prepared by Iqra Publishers, Rawalpindi, along "Islamic lines." Although not an officially approved textbook, it is being used currently by some regular schools, as well as madrassas associated with the Jamiat Ulema-e-Islam (JUI), an Islamic political party that had allied itself with General Musharraf. These picture scans have been taken from a child's book, hence the scribbles. The world of the Pakistani schoolchild remained largely unchanged, even after September 11, 2001, the event that led to Pakistan's timely desertion of the Taliban and the slackening of the Kashmir jihad. Indeed, for all his hypocritical talk of "enlightened moderation," General Musharraf's educational curriculum was far from enlightening. It was a slightly toned down version of the curriculum that existed under Nawaz Sharif which, in turn, was identical to that under Benazir Bhutto who had inherited it from General Zia-ul-Haq. Fearful of taking on the powerful religious forces, every incumbent government has refused to take a position on the curriculum and thus quietly allowed young minds to be moulded by fanatics. What may happen a generation later has always been a secondary issue for a government challenged on so many fronts. The promotion of militarism in Pakistan's so-called "secular" public schools, colleges and universities had a profound effect upon young minds. Militant jihad became part of the culture on college and university campuses. Armed groups flourished, they invited students for jihad in Kashmir and Afghanistan, set up offices throughout the country, collected funds at Friday prayers and declared a war which knew no borders. Pre-9/11, my university was ablaze with posters inviting students to participate in the Kashmir jihad. Post-2001, this ceased to be done openly. Still, the primary vehicle for Saudi-ising Pakistan's education has been the madrassa. In earlier times, these had turned out the occasional Islamic scholar, using a curriculum that essentially dates back to the 11th century, with only minor subsequent revisions. But their principal function had been to produce imams and muezzins for mosques, and those who eked out an existence as 'maulvi sahibs' teaching children to read the Quran. These figures appear to be way off the mark. Commonly quoted figures range between 18,000 and 22,000 madrassas. The number of students could be correspondingly larger. The free boarding and lodging plus provision of books to the students, is a key part of their appeal. Additionally, parents across the country desire that their children be "disciplined" and given a thorough Islamic education. The madrassas serve this purpose, too, exceedingly well. Madrassas have deeply impacted the urban environment. Until a few years ago, Islamabad was a quiet, orderly, modern city different from the rest of Pakistan. Also, it had largely been the abode of Pakistan's elite and foreign diplomats. But the rapid transformation of its demography brought with it hundreds of mosques with multi-barrelled audio-cannons mounted on minarets, as well as scores of madrassas illegally constructed in what used to be public parks and green areas. Now, tens of thousands of their students, sporting little prayer caps, dutifully chant the Quran all day. In the evenings they swarm the city, making women minus the hijab increasingly nervous. One cannot dismiss this incident as being just one of a kind. In fact, soon after the October 2005 earthquake, as I walked through the destroyed city of Balakot, a student of the Frontier Medical College described to me how he and his male colleagues were stopped by religious elders from digging out injured girl students from under the rubble of their school building. This action was similar to that of Saudi Arabia's ubiquitous religious 'mutaween' (police) who, in March 2002, had stopped school girls from leaving a blazing building because they were not wearing their abayas – a long robe worn in Saudi Arabia. In a rare departure from the norm, Saudi newspapers had blamed and criticised the mutaween for letting 15 girls burn to death. The Saudi-isation of a once-vibrant Pakistani culture continues at a relentless pace. The drive to segregate is now also being found among educated women. Vigorous proselytisers carrying this message, such as Mrs Farhat Hashmi, have been catapulted to the heights of fame and fortune. Their success is evident. Two decades back, the fully veiled student was a rarity on Pakistani university and college campuses. The abaya was an unknown word in Urdu. Today, some shops across the country specialise in abayas. At colleges and universities across Pakistan, the female student is seeking the anonymity of the burqa. And in some parts of the country she seems to outnumber her sisters who still "dare" to show their faces. This article is the Cover Story of the Jan. 2009 edition of 'Newsline' a Pakistani magazine. the horizon for help, but none seemed forthcoming. hut in flames with smoke rolling up to the sky. The worst had happened! Everything was lost! approaching the island. It had come to rescue him. "We saw your smoke signal!" they replied. midst of pain and suffering. ground: it just may be a smoke signal that summons the grace of God. feels like their hut is on fire today! practice it. It is more paying from the point of view of health also." CW I p.33.Complete works of Swami Vivekananda. Volume I.
Allah or the Lord Jesus Christ? The Muslim religion is by far the fastest growing religion in the UK . Last month I attended my annual training session that's required for maintaining my prison security clearance. During the training session there was a presentation by three speakers representing the Roman Catholic, Protestant and Muslim faiths, who explained each of their beliefs. Needless to say, the organizers and promoters of the 'Diversification' training seminar were not happy with this way of dealing with the Islamic Imam and exposing the truth about the Muslims' beliefs. I think everyone in the U.K. should be required to read this, but with the Liberal justice system, liberal media and political correctness madness, there is no way this will be widely publicised. Please pass this on to all your e-mail contacts. clue to what had just happened. card number, so she was using the ATM "thingy." and check about the batteries. It's a long walk." paper, put it on the photocopier and proceeded to make five "blank" copies. "cruise control" and then went in the back to make a sandwich. detector" was working, the suspect confessed.